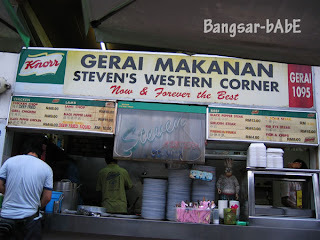 Had an early dinner with rif after work last week at Steven’s Western Corner. Located at Damansara Uptown Hawker, we’ve been frequenting this stall for quite a few years now as they serve pretty cheap western food. We both ordered the chicken chop (RM 8) which took 15 minutes to arrive.The crispy breaded chicken was served smothered with brown sauce, chips, coleslaw and a fried egg. The chicken was well-fried but I found the brown sauce too starchy. I asked for some mayo to go with our chips. The coleslaw was average; I wished my egg yolk was runny. 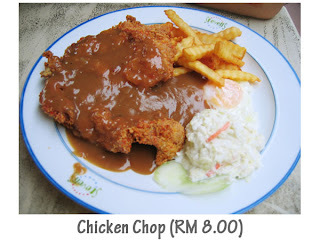 We still prefer their black pepper chicken chop to this. Dinner cost RM 18.40 inclusive of 2 cups of Teh Ais. The food used to be cheaper but I reckon they increased the prices due to inflation. Still pretty affordable and portions are decent. Verdict: Reasonable western food, average in taste, decent in sizing. Yes steven’s serve pretty good and affordable western but note that its only open at night. If you want to have some verity, just go a bit to the center of the food court and find this place call Pang’s. The western there is also good but just one staff away there is this stall that serves KILLER grill fish!!! Not for the light hearted as it is very spicy. If it makes u feel any better, someone stole my entire syllabus worth of Chemistry notes on Tuesday (a week before my Chemistry IGCSEs). Think about it, as someone envious of your good quality reviews – and lifeless enough to spend all that time covering up. Let’s turn that frown upside down! hey u should try the yong taufoo just oposite steven's corner, the best i can say, love it so much…..